The Old Harry Rocks are chalk formations in Dorset. Dave writes that the rocks were formed by erosion of chalk by the sea. He tells me of two possible origins of their name: they may have been named for the devil (called Old Harry), or for a local pirate, Harry Paye. The chalk cliffs were formed about 65 million years ago and are constantly being eroded and changed by the sea. Stair Hole is just west of Lulworth Cove in Dorset. It is a good demonstration of the “Lulworth Crumple,” the folded limestone strata that rise almost vertically. Dave sent me the cards in an envelope to save on postage, but also wrote a note on a really nice notecard that I want to share, too. 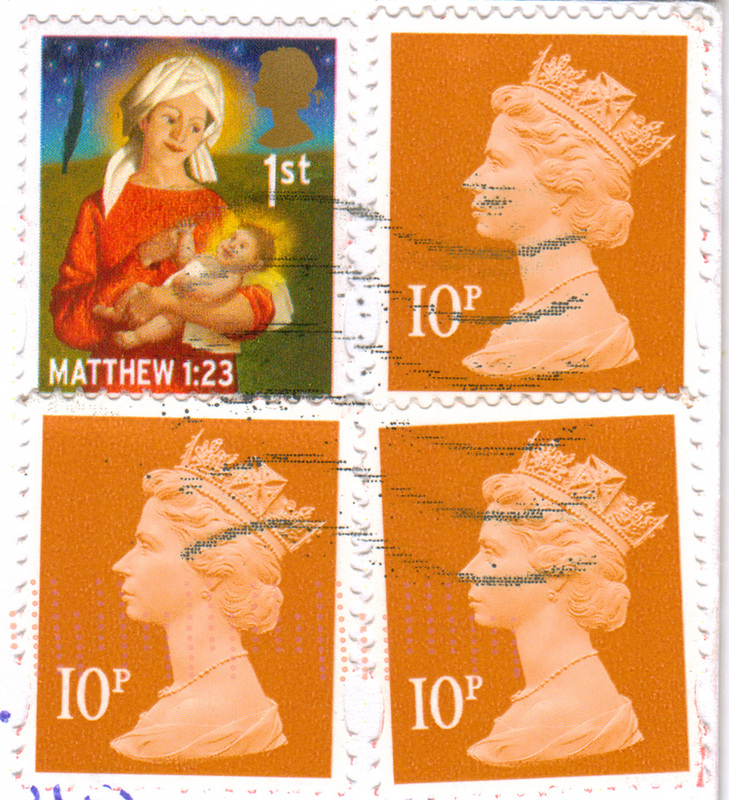 I really like this picture of different British stamps. It’s perfect for a mail enthusiast’s notecard! Thanks, Dave, for all the lovely cards! I now have four of them! I have a hard time deciding whether Matilda or The Witches is my favorite Roald Dahl book. 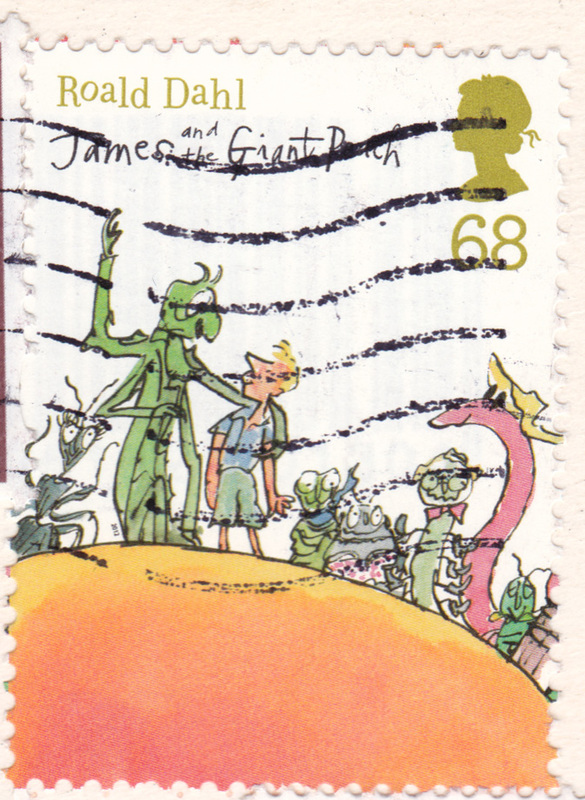 But I also loved The Twits, but I don’t have that stamp yet. I only need The Twits and the Charlie and the Chocolate Factory stamps to have all six. 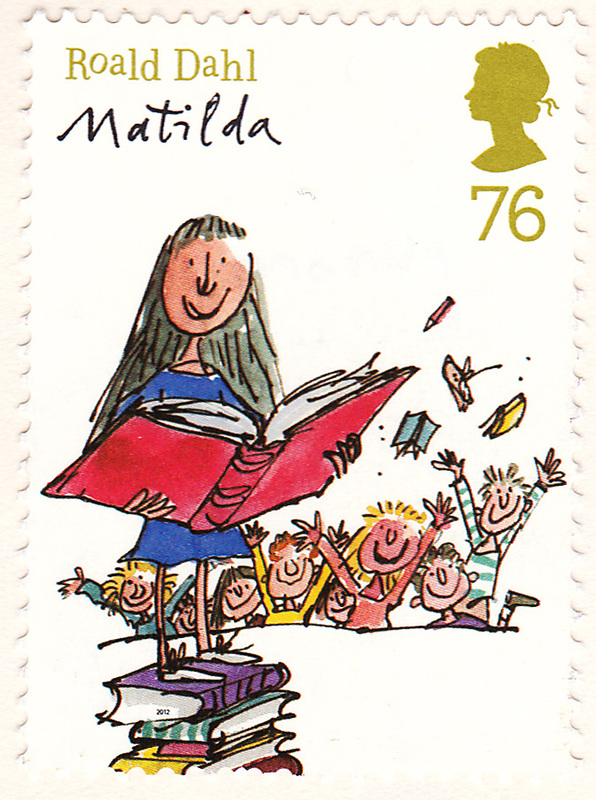 Thanks, Nat, for making my Dahl stamp collection 100% bigger! This is Bath’s Royal Crescent, built between 1767-74. It is composed of 30 grand houses. Although the fronts of the houses are all the same, each house’s owner was responsible for designing everything but the facade, so the backs of the houses are all different. Here is a multiview of the Roman baths at Bath, which give the city its name. The Baths were built in the first century CE and dedicated to the Roman goddess Minerva and the Celtic goddess Sulis. Both these cards come from Kym in England. Thanks, Kym! 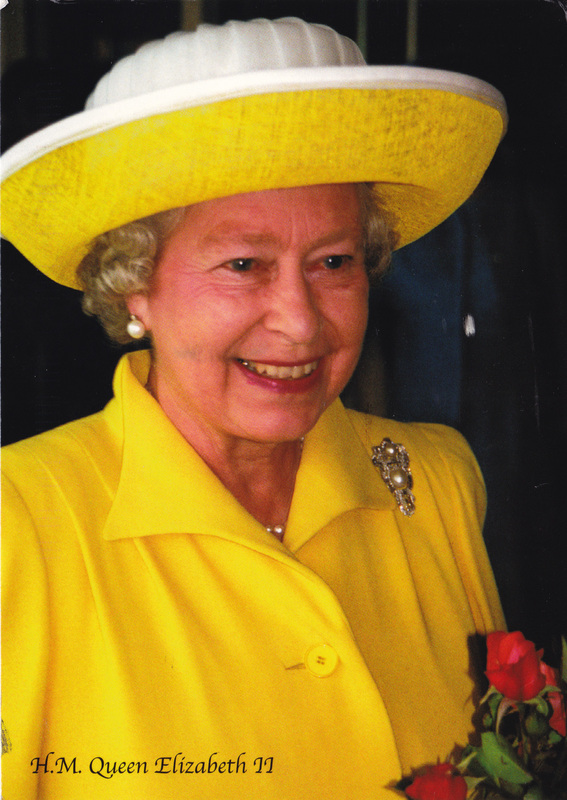 This card of H.M. Queen Elizabeth II comes from ellesbelles1909 from the Postcrossing forum. She looks very ready for spring in this bright yellow outfit. This card of Queen Beatrix comes from Erica_donker on the forums. 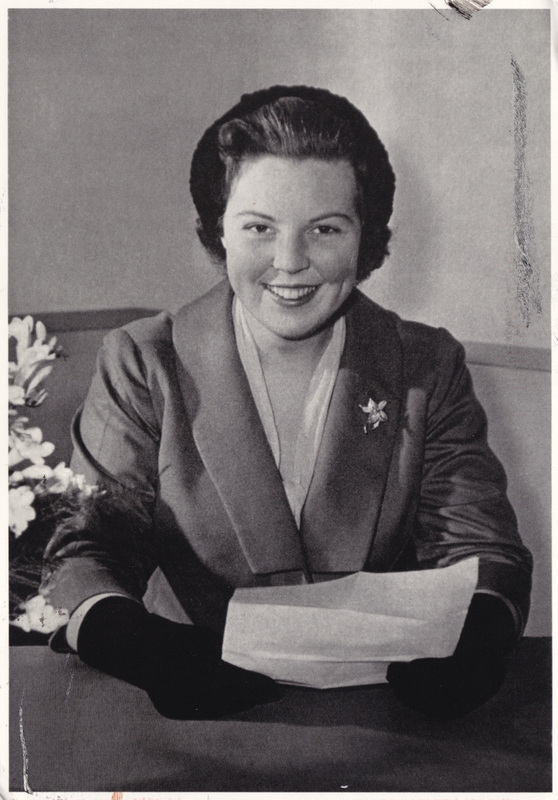 I’m not sure if this one should count, since the picture was taken in 1959, when Beatrix was still just a princess. I think it counts, though. Also, it is apparently difficult to find more modern pictures of Beatrix because, as Erica writes, everyone is interested in her son Prince Willem-Alexander. Sounds a bit like Queen Elizabeth, with all the attention on her grandson Prince William. Perhaps because the United States doesn’t have a monarchy, I’m completely fascinated by them. Kings and Queens seem so much more interesting than lying and cheating politicians. The one at top left is of the artist Rembrandt. I’m not sure what the birds are, but I like them and their long beaks. Westminster Palace, the home of the Houses of Parliament and Big Ben. 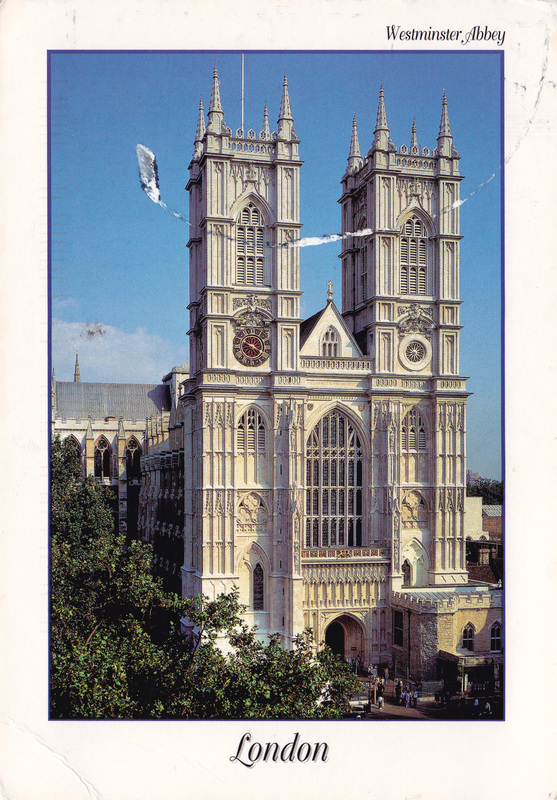 And Westminster Abbey, where the Kings and Queens are crowned and the location of many Royal Weddings. There are many famous figures buried here, as well, including Charles Darwin, Isaac Newton, and abolitionist William Wilberforce. These UNESCO sites are unique because I have actually visited all three of them! 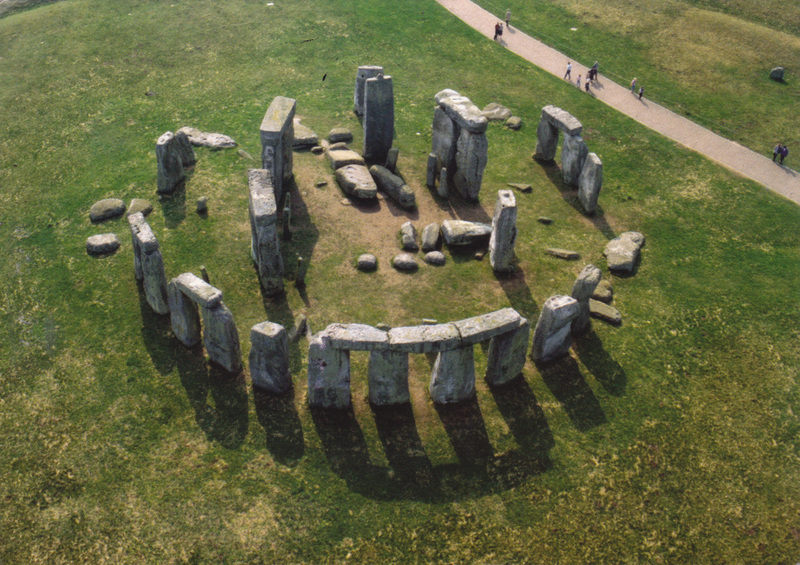 It has been several years since I was in England (I was there in 2005). I want to go back and revisit these places, since I don’t remember them as well as I want to. Of course there are many more places I’d want to see. It will have to be a long trip! My qual is finished! Now I can get back down to sharing my mail with all of you. I’ve been getting veritable piles in my mailbox the past few mail days. I guess that’s what happens when you offer all 700 or so of your cards for trade on the Postcrossing forum (that’s still open, by the way). And the stamp! 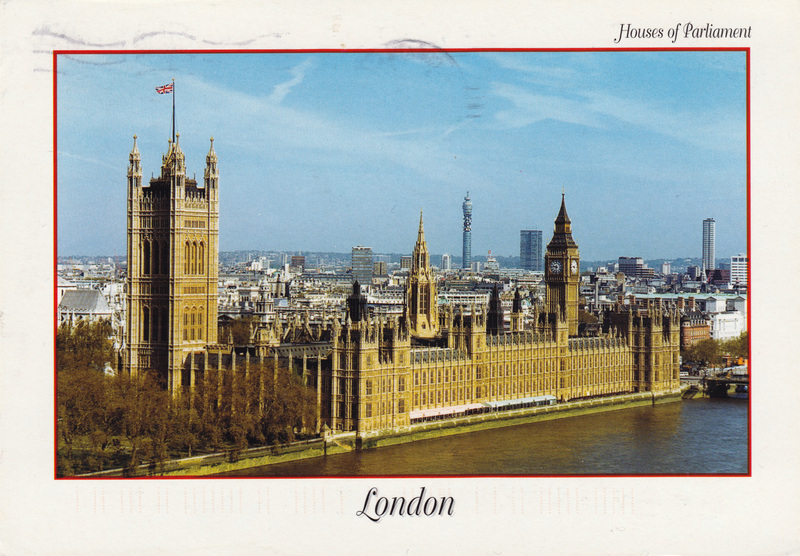 They come from gran7, who also sent this card from Saltaire. She writes that she likes to read Roald Dahl to her grandchildren. That sounds so wonderful! I read Roald Dahl as a kid, I hope I can read his works to my kids and grandkids someday, too. Although he’s best known as a children’s writer, he’s written some stories that are definitely not for kids that are also quite enjoyable. I’m jotting off a quick post now to procrastinate on packing up to move back out to Oregon. My flight leaves bright and early Friday morning. I am completely baffled about how I’m going to take all my cards back with me- I not only have 60 received cards to take along, but I’ve acquired many books of new postcards, and the box I brought them in is overflowing! The top card shows Durham Castle and the bottom card shows Durham Cathedral. The cathedral is the resting place of St. Cuthbert, St. Oswald, and the Venerable Bede, who is also known as the “Father of English History.” The Cathedral is also apparently the model for the Hogwarts school in the Harry Potter films, according to Wikipedia. 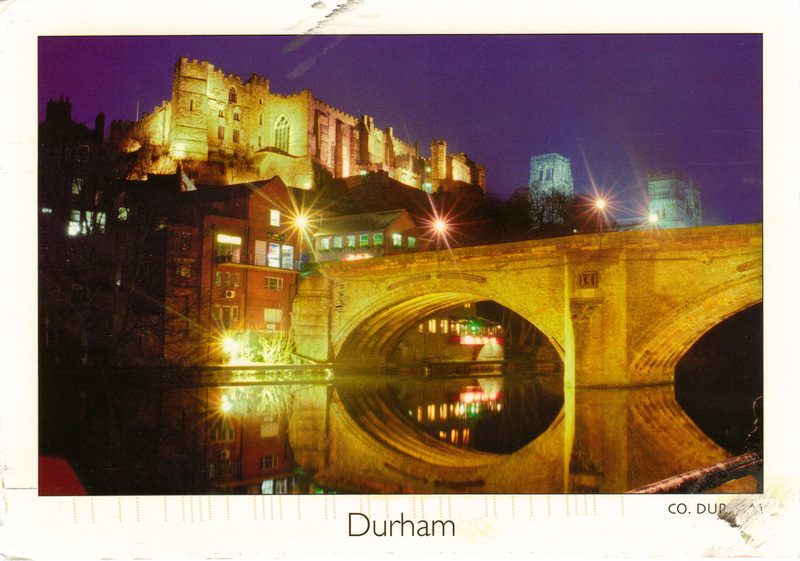 Brian writes that the castle in Durham is still part of their University, and some students actually get to live there! I think college is a life-changing experience, imagine how much different my life would be if I lived in a castle! These two cards check off one more UNESCO site from my list. 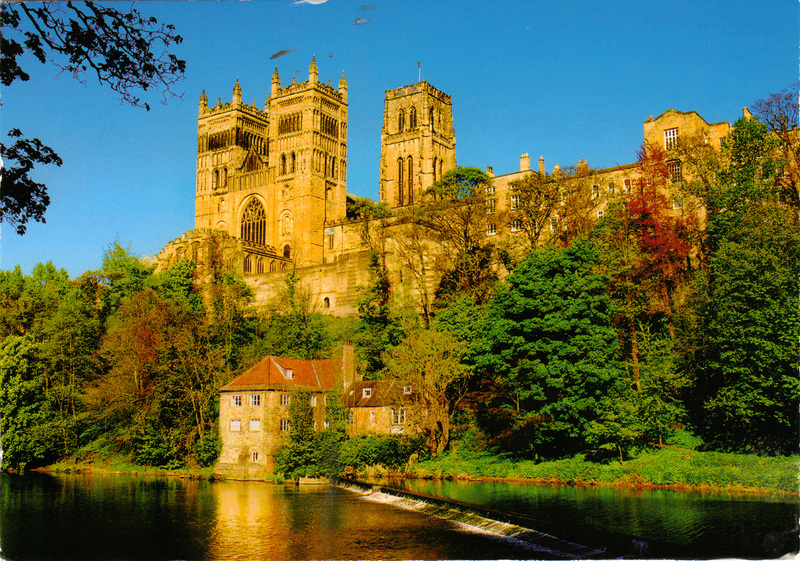 Durham Castle and Cathedral were inscribed as one site in 1986. I’m got back home safely this weekend and had a nice pile of cards waiting for me. The scanner here is not as easy to use as the one I have at school, so posts may be a little less frequent. I have two new UNESCO sites to share today. Both sites are actually a combination of many different places in the same town. 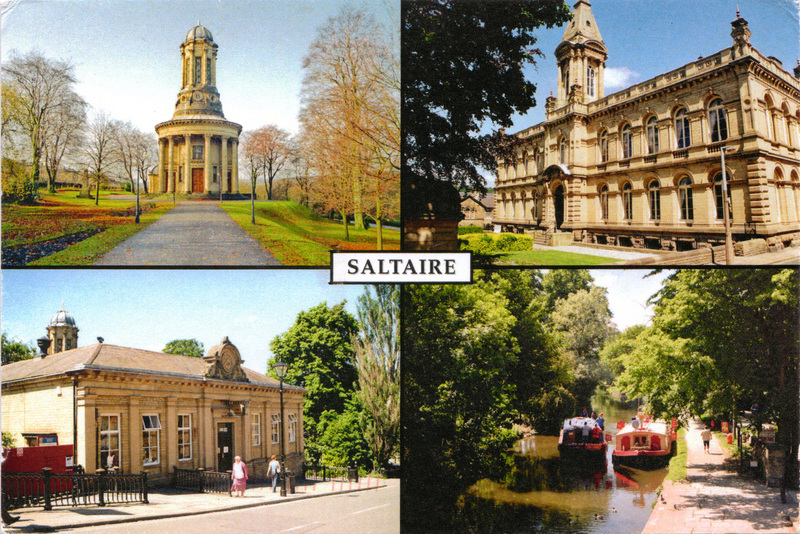 This first card is from Saltaire, England. The whole village is listed as a World Heritage Site. This card shows (clockwise from top left) the United Reformed Church, Victoria Hall, Leeds-Liverpool Canal, and Shipley College. Each building is individually listed and protected, with the Church having the highest level of protection. This card comes to me from Eileen from the Postcrossing forum. 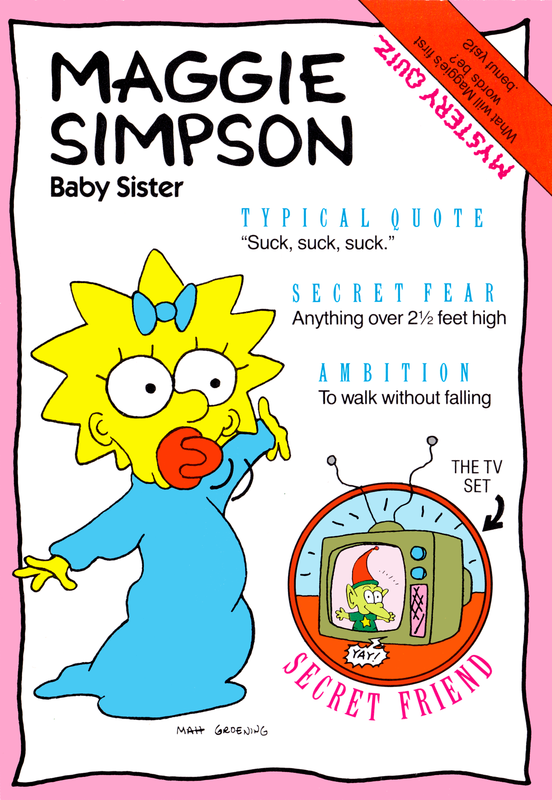 Luckily, Eileen had these cards but is not a UNESCO collector herself. I am very far away from the closest UNESCO site when I’m at school, so I don’t have those cards to send. I’m very happy when I can add to my collection by swapping another kind of card. 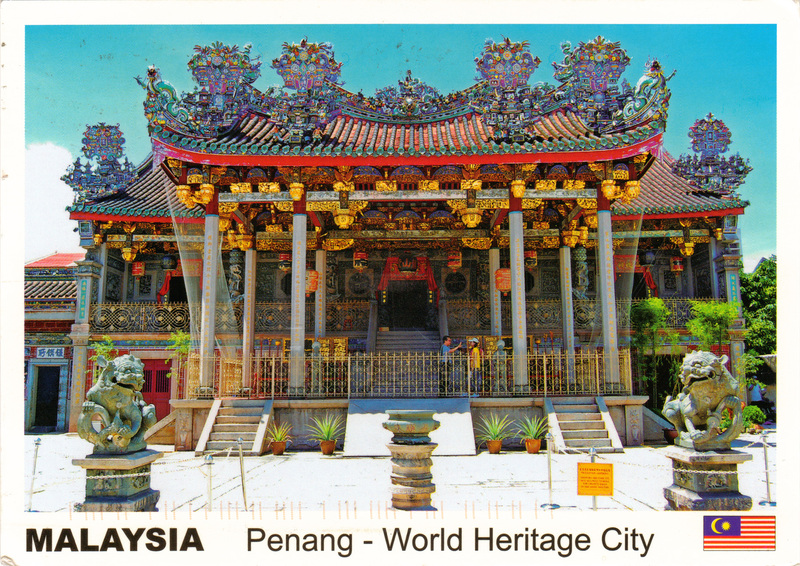 This card shows the Khoo Kongsi clanhouse in Georgetown, Penang. This is just one of the gorgeous buildings that comprise the site of Georgetown and Melaka, Historic Cities of the Straits of Malacca. Abu is trying to collect a map of all fifty states. I offered him Pennsylvania in exchange for this card, but there are still many that he is seeking. As you can see, he sends lovely cards in return. 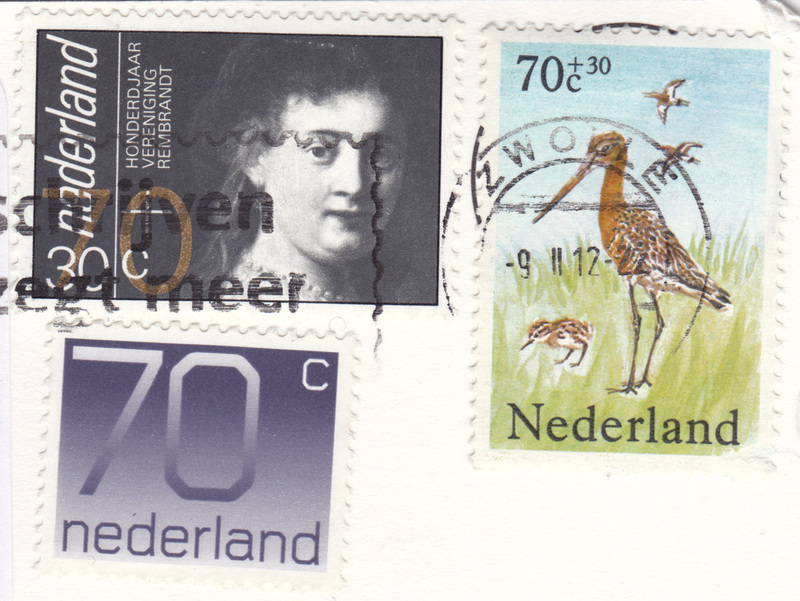 If you’re in the US and active on the Postcrossing forum, check out his request here. Well, those are all the cards for today! The mail seems to be slowing down because of the holidays. What arrived in your mailbox this weekend?